Theorigin of a mysterious glow that stretches across the nighttime sky has beenidentified by scientists who examined the particles that make up the luminousdust cloud. Calledzodiacallight, the faint glow is caused by millions of tiny particles along thepath followed by the sun, moon and planets across our sky, also known as theecliptic. Thefaint,whitish glow, which can be seen best in the night sky just after sunset andbefore sunrise in the spring and autumn, was first correctly identified byJoshua Childrey in 1661 as sunlight that is scatteredin our direction by dust particles in the solar system. Yet,the source of the thick cloud of dust has been a topic of debate. Ina new study, David Nesvorny and Peter Jenniskens found that more than 85 percent of the zodiacaldust originated from Jupiter family comets (so-called because their orbits aremodified by their close passage to the gas giant Jupiter), rather thanasteroids, as was previously thought. 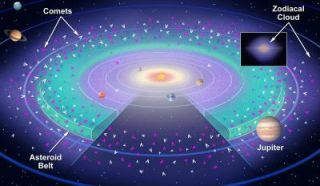 "Thisis the first fully dynamical model of the zodiacal cloud," said Nesvorny, a planetary scientist at the Southwest ResearchInstitute in Boulder, Colo. "We find that the dust of asteroids is notstirred up enough over its lifetime to make the zodiacal dust cloud as thick asobserved. Only the dust of short-period comets is scattered enough by Jupiterto do so." Theresearchers identified the dust coming from Jupiter family comets afterexamining the shape of the zodiacal cloud, said Nesvorny. "Withother comets, like the Halley-type comets, they have large orbitalinclinations," Nesvorny told SPACE.com. "They are coming into the inner solar system from all directions, so ifthese comets were producing the zodiacal cloud, it would be almost a ball, andnot a disk. Telescopes, like Spitzer, all show that the zodiacal cloud is adisk. This points best to Jupiter family comets, which have more moderateinclinations." Theseresults confirm what Jenniskens, an astronomer withthe SETI Institute in Mountain View, Calif., had long suspected. As an experton meteor showers, Jenniskens had noticed that mostconsist of dust moving in orbits similar to those of the Jupiter family comets,but without having dust-shedding comets associated with them. Instead,Jenniskens discovered a dormant comet in the Quadrantid meteor shower in 2003 and has since identified anumber of other such parent bodies. Whilemost are inactive in their present orbit around the sun, all broke apartviolently at some point in time in the past few thousand years, creating debrisin the form of duststreams that have now migrated into Earth's path. Nesvorny and Jenniskens, with thehelp of Harold Levison and William Bottke of the Southwest Research Institute, David Vokrouhlicky of the Institute of Astronomy at CharlesUniversity in Prague, and Matthieu Gounelle of the Natural History Museum in Paris,demonstrated that these comet disruptions can account for the observedthickness of the dust layer in the zodiacal cloud. Indoing so, they also solved another mystery. Itwas long-known that snow in Antarctica is laced with micrometeorites, some 80to 90 percent of which have a peculiar primitive composition, rare among thelarger meteorites that originated from asteroids. "Thesemicrometeorites are small meteorites that are about 100 microns in size," Nesvorny explained. "These micrometeorites arecollected in the Antarctic ice, and it's been puzzling as to why they have adifferent composition than the large meteorites that are collectedelsewhere." Nesvorny and Jenniskens suggestthat most Antarctic micrometeorites are actually fragmentations of comets,which explains the different composition from other meteorites that come fromthe asteroid belt. According to their calculations, cometary grains dive into Earth's atmosphere at entryspeeds low enough for them to survive and reach the ground. Thestudy will be detailed in the April 20 issue of The Astrophysical Journal.